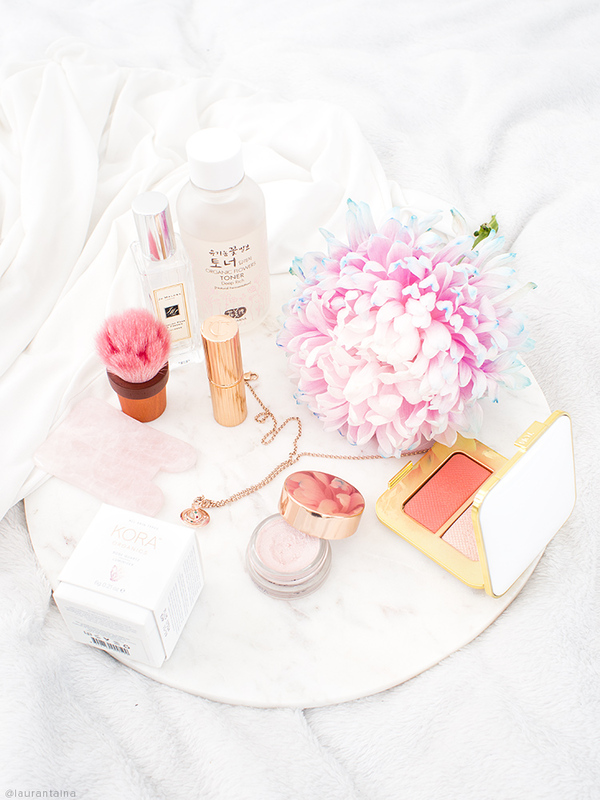 I'm constantly asked about eco makeup products, so I'm happy to review you the beautiful highlighter** by supermodel Miranda Kerr's brand, Kora organics! Btw: I'm sorry I haven't been posting as constantly lately - I just dealt with almost 3-week-long flu/cold, but now I'm back with a lot of new and fun upcoming posts! Enjoy! Kora Organics is a brand created by Australian model, Victoria's Secret Angel (lingerie giant's model) and self-help author Miranda Kerr. I used to be obsessed with models, fashion magazines and candid photos in my youth, but for the past few years I haven't paid any attention. I don't have a TV to follow Victoria's Secret shows - I highly doubt they even sell the brand in Finland. I still highly admire women who have made a business out of their modelling career as fashion isn't an easy business. Same goes with beauty. It "makes sense" a model would create their own clothing or beauty line, but to my understanding Miranda is also very passionate about sustainability, natural ingredients and organic life. The highlight ingredient of Kora organics is a fruit called noni, which is a "super fruit" that can be taken internally and externally. I learned Miranda has drank the juice of noni fruit since she was a child. Kora Organics Rose Quartz Highlighter is a cream pot highlighter with rose hued luminous glow. Can be used on the high points of the face with be used with fingers or a small brush. The ingredients are mostly organic and 98.8% of natural origin. 6g/0.21 oz of product for 28.90€/$28 (Kicks.fi* and Sephora.com). Don't you hate the expression when someone (especially a beauty blogger) is obsessed with something? Well, I am with this highlighter. It gives the most natural sheen without being too subtle or undetected. The luminizer makes the high points of your face to stand out and glow without looking like you've applied highlighter. Perfect for the "glowing from within", seamless finish. I'm especially happy that the luminizer is easy to blend with fingers. I very lightly dip my index finger into the cream, do two to three taps on my cheek bone and use my middle finger to blend. If you need some inspiration or tips how to highlight your face, read my highlighter tips post. My mind does a little scream every time I dip my fingers into a cream product, but that's life. I think you could use a concealer brush, a small goat hair or synthetic brush to blend and buff this product, but honestly I think softer cream products are the easiest to apply and blend with fingers. I leave my brushes for harder cream products, such as the THREE Duo Highlighter (review here). Here's some highlighter applied on my cheekbones and cupid's bow. 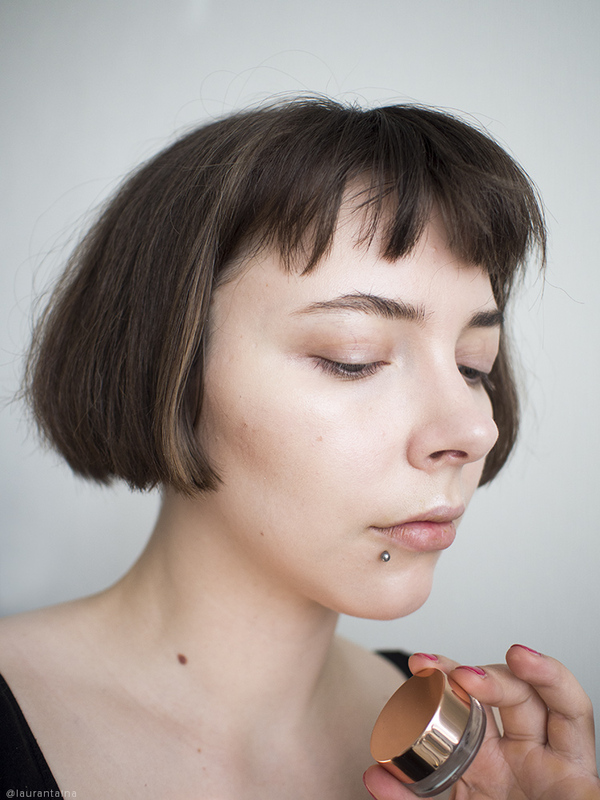 It blends into my foundation very seamlessly, it was pretty hard to capture on camera - congratulations if you notice anything, but take my word: it looks beautiful in real life!! I usually don't dig the ingredients of makeup products, but as this is almost 100% natural and organic ingredients, I thought I would paste them for you. I was hesitant to use a makeup product high in coconut oil on my face, but luckily I've had zero congestion from using this highlight. I've also had no reaction from RMS beauty products, so if they worked for you so might Kora. If you're sensitive to shea butter or coconut oil proceed with caution or ask a sample. I don't own Tata Harper or RMS highlighters, but compared to my RMS Buriti Bronzer the Kora is much more softer in texture and doesn't feel as dry. Notice: Coconut Oil etc natural butters should be kept under 30°C / 86F to avoid melting. Finland is now having a heatwave and my highlighter is a bit soft in the middle. The color of Rose Quartz Luminizer is icy pale pink. In these pictures it looks almost lilac, but don't worry - this isn't an "unicorn highlighter" but has just a strong white undertone. I have nothing like it, but I swatched two of my pinky highlighters and the paler side of TF's Paradise lust and THREE Shimmering Glow Duo 01 (review here). This highlighter is a clear winner for me! I hope Kora Organics brings out more complexion products - if so, I'll be first in the line! (Please, Miranda, bring out a BB cream! Right now I'm testing Kora's skincare items, I hope to report back soon, but so far... I'm impressed. What's your favorite eco makeup item? Do you love cream products for the Summer? **Kindly PR gifted for consideration. Images and thoughts are my honest and my own!